Home » Food » Natural food » What Is Kimchi? Whether you’re a traveler or simply an active foodie in your surrounding, chances are you know what is kimchi. A daily staple in Korean cuisine, kimchi has been consumed and adored for over a thousand years, making this fermented concoction a must-try item next time you find yourself in its Asian motherland – or at the store, even though we all know store-bought things aren’t as good as the real deal. Read on to find out more about kimchi, its variations and all the different ways you can benefit from it. Earlier in its days, kimchi was merely a side dish of some pickled vegetables. When the modern era came around and chili was introduced to the country, the dish got spicier as chili peppers were added to the traditional recipe. Kimchi-jjigae came to be soon after that. There isn’t one specific recipe to make kimchi; in fact, there are hundreds of varieties around. However, the most common type is the napa cabbage kimchi. The trick is in the seasoning. All you need is some napa cabbage, Korean coarse sea salt, Korean radish, scallions and water. And that’s just for preparing the main vegetable, the seasoning is a whole different story. The seasoning ingredients most commonly include: glutinous rice powder, Korean red chili pepper flakes, raw minced shrimp, salted shrimp, fish sauce, minced garlic, ginger and water. Quantities vary and it all depends on where you get your recipe from. The more you acquire a state for kimchi, the more likely you will be to be able to customise the recipe according to your own preferences. The word ‘jjigae’ is the equivalent of ‘stew’ in Korean. Kimchi-jjigae is thus a stew-like dish made primarily with kimchi, and ingredients such as onions, scallions, pork, seafood or tofu. In order to make this dish, the most important thing, according to the older generation who could be deemed as ‘kimchi experts’, is to use “old” fermented kimchi; not only will there be higher amounts of good bacteria in it, it will also bring about a stronger taste that will be able to withstand the cooking process and give a rich flavor to the rest of the ingredients. Sliced kimchi is mixed together in a pot with one or more proteins, such as pork, seafood or tofu, and flavouring vegetables such as spring onions and garlic. To make the stew, water or anchovy stock can be used and brought to a boil, seasoned with bean paste and red pepper paste. What is Kimchi Good For? Many of us aren’t aware that the main control center of our immune system is in our gut. Hosting over 100 trillion of bacteria, both beneficial and not, the gut needs to maintain a certain balance to prevent the pathogenic bacteria from taking over and causing health problems that can sometimes be long-lasting, such as allergies and autoimmune diseases. Fermented foods are packed with good bacteria, and as such they should be consumed somewhat regularly to keep ourselves healthy and happy. Kimchi belongs to this category. 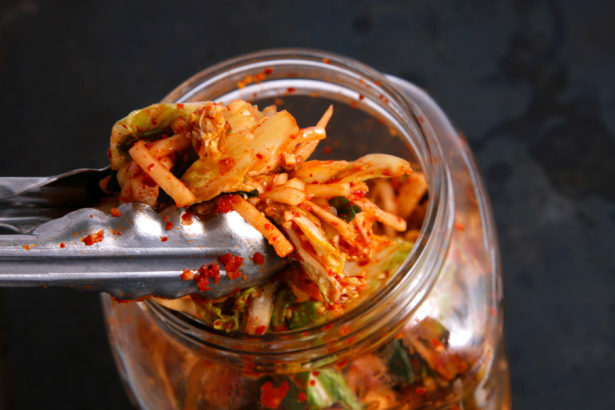 Your digestion benefits immensely from a fermented food such as kimchi. Not only does it have a great quantity of probiotics that help the intestinal flora stay balanced, it also has good detoxifying properties, which cabbage is mostly known for. The intestines are able to clean up faster and can better absorb all the nutrients acquired from ingested food. Furthermore, its hight fiber content helps prevent constipation. Kimchi is also associated with weight loss. The lactobacillus bacteria present in the food is used by the body to control appetite while also reducing blood sugar levels. It keeps you full with its fiber and prevents you from overeating. The garlic present in this fermented dish is rich in allicin, a substance that helps lowering cholesterol levels, thus keeping you away from cardiac disorders such as heart attacks and strokes. Furthermore, garlic also has selenium, which helps keep the artery walls strong and elastic, and preventing atherosclerosis. These are just some of the numerous benefits derived from regular kimchi consumption. The more you eat it, the more you’ll found out about them yourself. What Does Kimchi Taste Like? As mentioned above, there is no universal recipe for kimchi. Every individual prepares it according o their own taste, by varying the amounts of seasoning, the vegetables, the length of fermentation and the temperature. No two households will prepare the same exact kimchi. Indeed, it’s so unlikely for separate individuals to come up with the same tasty kimchi, that it’s a big conversation topic among Koreans, with families inviting each other over for dinner every time they are proud of their last batch that came out much more delicious than their previous one. As a consequence, the taste varies widely, though it’s generally sour and incredibly spicy. You’ve been warned! What is Kimchi Good to Eat With? Kimchi dumplings: just wrap some of the spicy goodness with a protein of your choice in a dumpling wrapper and pan fry them or steam them. Easy as pie. Kimchi fried rice: stir some kimchi and rice, add meat, seafood or tofu, and a bit of kimchi juice, and your dinner is ready! Ham & egg kimchi cups: just mix all three ingredients in a little pot and put them in the over until the egg whites are cooked. A nice way to spice up your breakfast. Kimchi noodle stir fry: add kimchi and extra vegetables or protein to your noodles and stir fry them. You’ll have a delicious spicy dish in less than 15 minutes. Kimchi spaghetti: a good fusion dish to mix your Italian cravings with some chili. Grab some mushrooms, bacon, kimchi and green onions, and stir. You’ve got your spaghetti sauce ready to welcome your guests and surprise them for dinner.